Now you can take your own pictures, send them to us, and we will create the same high quality tour that you have come to love. This is for Slideshows only!! Your tour will be made into two different versions: one branded with your contact information; and, another unbranded for the MLS. It will also qualify for a New Tour Announcement (NTA) to be sent by email to our subscribers!!! We do ask that your shots be provided to us in a format that is at least 640x480, and the larger the better! Or if you would prefer that we simply grab the shots directly from the MLS listing or some other web listing for you, please let us know. I understand that by clicking "ADD TO CART" below and completing this order that I am agreeing to the Terms of Service. No Reviews For This Product. 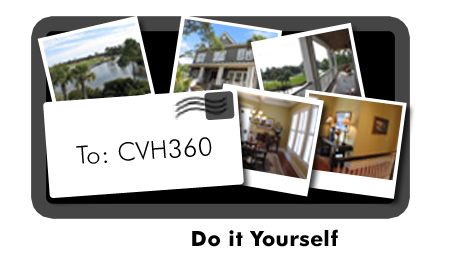 CVH360.com is a one-stop shop for all your real estate needs. We have everything you need to exhibit all of your property's greatest assets.